This page has moved http://www.thelandman.net/alpine-hills-lake-private.html and will no longer be updated! 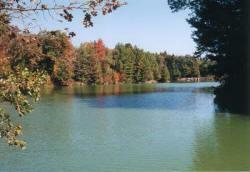 Alpine Hills Lake is located in Central Wisconsin, Juneau County just north of Elroy. 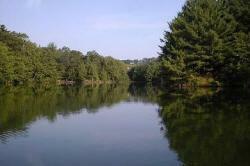 This 20 acre private spring fed man made lake has a max depth of 30 feet which is set in a valley of Plymouth Township. 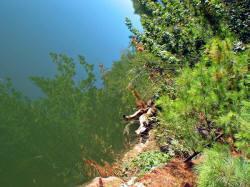 The lake took shade of the valley which is surrounded by huge pine trees giving it that Up North feeling. One end of it was dammed up with and has a single over flow tube that flows into a small creek. There is a water pump on a 2 Acre outlot that is use to maintain the water level in the dryer months as needed. Alpine Hills Lake is known for it's great panfish, largemouth bass, you'll caught the oh occasional walleye and northern pike. It was stock with Trout a few years ago. 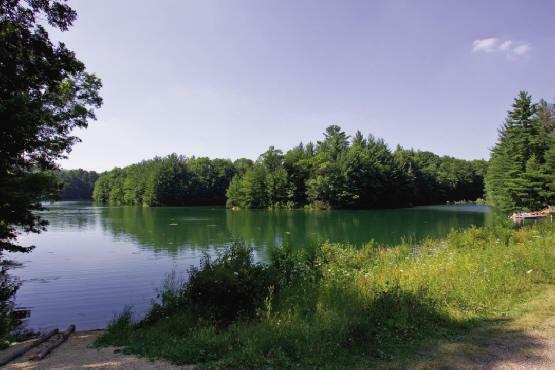 Alpine Hills Lake is a private lake and only open to owners in the development off water lots and deeded access to a six acre waterfront parcel. This is no motor Lake! Dam: A Man-made dam of rock and earth on the Eastside blocking the Valley with a single overflow tube. 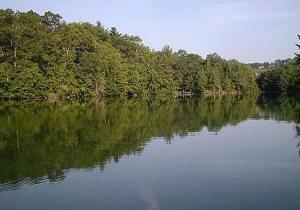 There are 68 private wooded lots around the Lake and three out lots. The subdivision is surrounded by large farm acreage on all sides and is close to the Sparta 400 Bike Trails. Alpine Hills Lake is located in Central Wisconsin, Juneau County just north of Elroy. 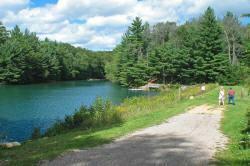 This 20 acre private spring fed man made lake has a max depth of 30 feet which is set in a valley of Plymouth Township.